The Yarkon park, with its shady riverside paths and small forest provides the perfect urban park landscape for a good hike. Races, marathons and triathlons take place throughout the year around the country. In Tel Aviv, one of the most scenic routes for runners during sunrise and sunset is the dedicated 4 kilometer sea promenade (Tayelet) running path. 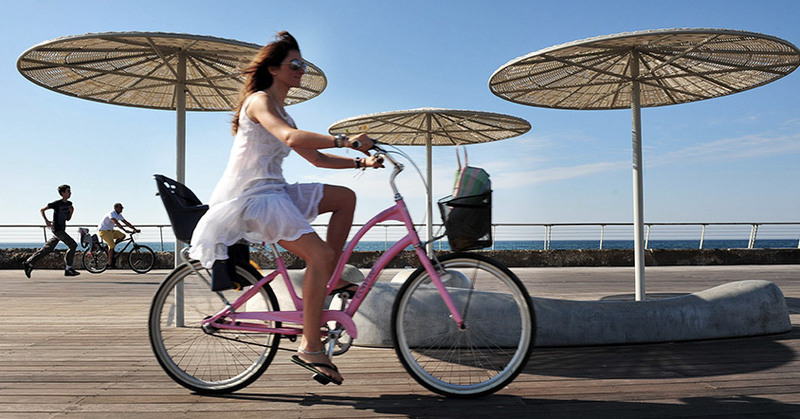 Tel Aviv now boasts 70 kilometers of marked bike lanes which means that finally, bike lovers can safely take advantage of the city on 2 wheels (invaded now and then by pedestrians!). Ask at Concierge for a bike. Tel Aviv is the perfect size city for walking fans. From the bursa section, our local Wall Street in Ramat Gan, a 30 minute walk takes you to Rothschild Avenue and from there, there are many strolling routes through interesting streets leading to the sea or parks. Any time of the year is swimming time in Tel Aviv. The Mediterranean is open 24/7 & the winter water even has its fans. For the less brave: The rooftop infinity pool at The Norman provides guests with wonderful urban sea views. The wonderful outdoor sea-water pool of Gordon beach is popular and pools like the one in the Dizengoff centre provide swimmers with heated water. There is no matching the Tel Aviv Rollers for a skate around the city. The loosely confederated group of 150 rollerblading and rollerskating enthusiasts takes to city streets every Tuesday evening starting at Ben Tzion Boulevard. It is amazing to see them speeding around the city. Everyone is welcome to join in, no need to sign up in advance. In Tel Aviv’s Yarkon Park (near the Sportek), you’ll encounter on-the-fly games of Soccer and Basketball to join in the evenings. And for a fun, sandy game of beach volleyball on Saturday, try Bograshov Beach.